Future Music Festival Asia Today! 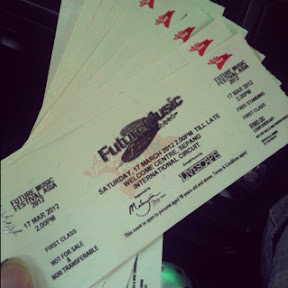 I've just collected the tickets for today's Future Music Festival Asia gig happening at Sepang Circuit. With performances from world class DJs, regional and local acts will also be involved. The tickets are 1st class tickets which I hope will get me a better view and much closer to the action. 2pm to 2am, 12 hours of non stop amazing music. I just can't wait. Will you be there?